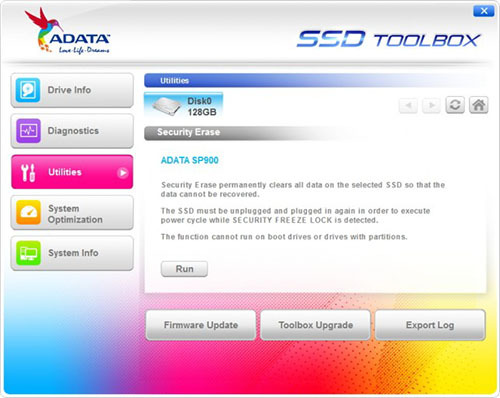 ADATA SSD ToolBox provides multiple ways for users to obtain disk information, and change settings easily. Additionally, it can speed up your SSD and improve its lifespan. Get assigned drive information including capacity, used space on drive,drive temperature, drive health, and lifespan of drive. Two options: Quick Diagnostics, which will run basic tests on free space of the selected drive, and Full Diagnostics, whick runs a read test on all used space of the selected drive. SSD utilities include Security Erase, Firmware update, SSD Toolbox upgrade, and export log. SSD Optimization provides TRIM service on free space of drive. OS Optimization provides simple settings SSD optimization.